Thank you Richard The Brit of Divevets, for the excellent video that he sent me. It is a step by step training guide on how to teach your dog to dive for lobsters that was put up by the YouTube channel Devoted to the Ocean. I really have no idea where this channel originates, but my guess is Florida where lobsters apparently sun themselves in daylight and act like they are dead when caught. Even though I have never dove for lobsters in Florida, I can only say that these are not California lobsters which hide between rocks and in reefs during the day and only come out only at night. Also, there is no gear code for “Dog” on the California Lobster Report Card, but maybe it would be considered free diving? Also undetermined, is how would a dog obtain a California fishing license? 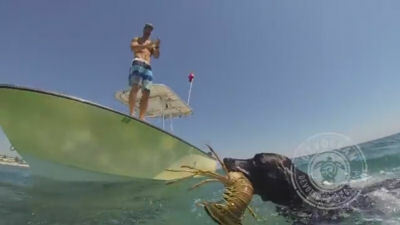 Maybe training your dog to catch lobsters is not practical here, or even realistically in Florida, but it is a fun video to watch.